*Data taken from official Key Club website on 3/22/2013, where we were unable to find honor cords for graduation in the product offerings in their online store. Graduation cords are worn by high school graduating seniors at schools where their wear is authorized, often in recognition for participation in a . The honor cord represents hard work and dedication to service, along with leadership, caring, and character building. 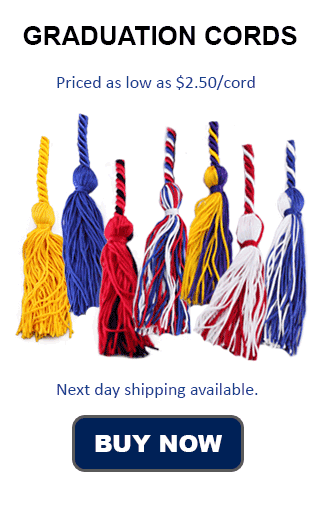 There is no specific color or style set in stone that a school's graduation cords need to be. That is up to the individual High School, what kind of honor cord they want students to wear. One common choice is some combination of blue and gold. Possibilities for that include royal blue with gold, and gold with royal blue braided graduation cords, as well as blue and gold double cords. If blue and gold doesn't work for honor cords at your school, any color will work that you feel embodies the values of the student clubs in your choice of graduation cord. A single gold cord can be used as well, and is the most popular option for graduating students. Many clubs exist which are designed to help students build and develop their interests and abilities. Often, the main goal of these clubs is to help students discover the value of service, and in so doing students are able to build relationships and focus on academic pursuits and excellence.